TB Parts Headlight Assembly for the Honda Z50A K1/K2 models. This is a Hi/Lo beam set-up with a 6 volt 15 watt/15 watt dual filament globe. 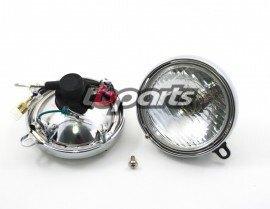 To suit a 105mm headlight bucket.